Knitting Gallery - Come See My Pretty Knitting Projects! 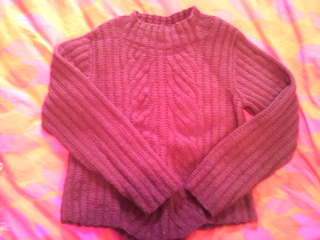 My knitting projects include many garments, especially woman sweaters. Those days (before I had twins!) seem long gone and I found myself knitting mainly baby stuff. Each piece of projects are different and special to me. I still want to hold on to them as long as I can. I even hang on my twins' jackets and blankets when they were infants in hope of giving them to my grand-children! I donated a lot of my sweaters to charity because I had too many of them and I can't wear them all! It was sad to see them go, but it was nice to know that they all go for good causes. 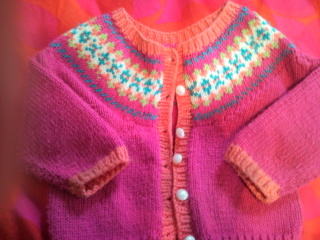 I love this fairisle pattern baby sweater I knitted when my twins were less than a year. They grown out of it so fast. I only put it on them 2-3 times. I'm saving it for my grandchild! This baby sweater was quite fun to knit. It has rib pattern on body and sleeves and two front pockets. 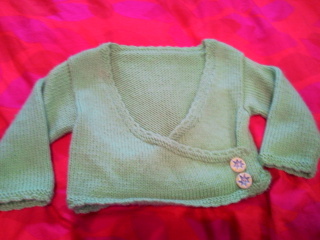 I used affordable and washable acrylic yarn because I never know what kids will do to the sweater. The girls outgrew the sweater so quick. They only wore this one for couple of times. This adorable baby top is knitted with cotton and rayon yarns. I made this one for my twin girls. I found those pretty handmade ceramic buttons in Thailand. 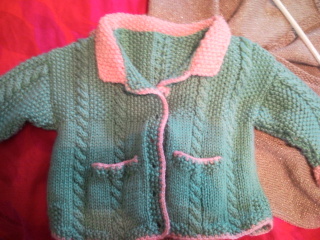 The baby sweater pattern came from a knitting book, a gift from my friend. 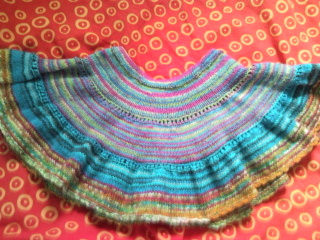 This skirt is knitted in circle using circular needles. I used wool sock yarn I bought in Edmonds, Washington while visiting my husband's family. I love the way pattern came out. It's fun to see the kids enjoy wearing them. This skirt is similar to the one above. It just knitted in different yarn. I used baby worsted weight yarn for this one. It's very durable. 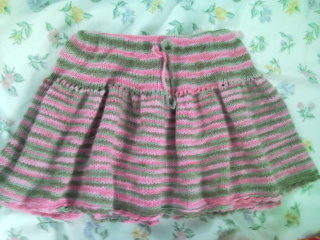 I knitted this skirt with superwash wool. 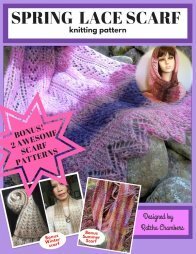 I design this easy knitting pattern myself. The result came out very nice. Sometimes, simplest is the best! 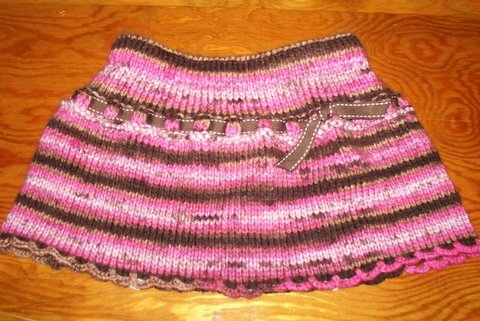 I will add this skirt pattern to the beginning knitting pattern collections. Baby socks are so fun to knit. With this superwash wool I can wash it over and over again and the sock still stay the same. The girls love them, especially to slide on the wooden floor! 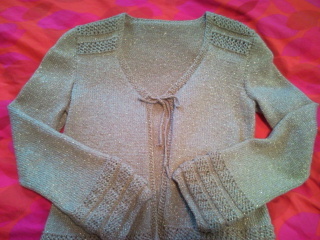 Love this golden hand-knitted cardigan's sophisticate look. It's perfect for evening wear. I used soft, sparkle tubular yarn from Lion Brand. I got this knitting pattern from Vogue Knitting Magazine. It was very challenging knitting those ribbing. 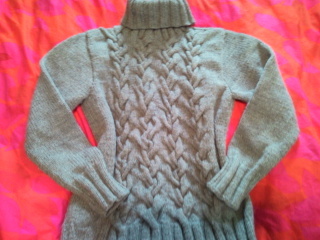 I knitted the back portion and sleeves on Ultimate Sweater Machine (USM). I couldn't wait to see how it turn out when I first knitted. This turtle-neck sweater made out of wool. I love the gray color! This vintage camisole reminds me of Jackie Onassis Kenedy for some reason. The patterns was passed along to me from a friend's mom who live in Pennsylvania. She loves to crochet and knit. 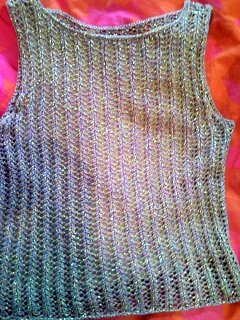 Fast and fun knitting project, this camisole is soft and comfy. 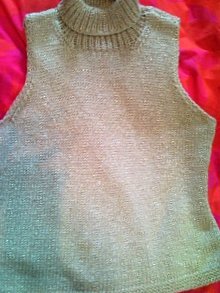 Knitted with sparkling-golden-tubular yarn from Lion Brand. This pull over pattern is pretty clever. The ribbing pattern is made by passing stitches over the others without having to use cable needle at all. An uneven bottom edge gives it distinctive look. I used pure wool on this one. There You Have It! Hope You enjoy my knitting Projects. I will slowly upload some more pictures. So stop by at my knitting gallery again to see more knitting projects. 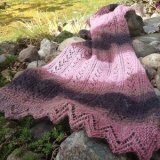 Show Off Your Knitting Projects Here. Proud of your knitting projects? Share your works here with us. Your knitting could be on the front page for picture of the month! What Other Knitters Have Said About Their Knitting Projects.